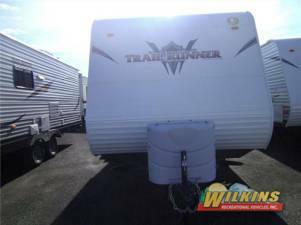 Heartland Trail Runner SLE Travel Trailer w/Rear Corner Bath Including: Tub/Shower, Toilet & Sink, Rear Corner Dbl. Bed w/Bunk Above, Booth Dinette w/Overhead Storage, Storage, Refrigerator, 3 Burner Range, Dbl. Kitchen Sink, Sofa, Front Queen Bed w/Nightstands & Wardrobes & Much More!